Baukash - Librería Electrónica: Retórica y de compromiso en las Humanidades Digitales. Retórica y de compromiso en las Humanidades Digitales. Digital Samaritans explores rhetorical delivery and cultural sovereignty in the digital humanities. The exigence for the book is rooted in a practical digital humanities project based on the digitization of manuscripts in diaspora for the Samaritan community, the smallest religious/ethnic group of 770 Samaritans split between Mount Gerizim in the Palestinian Authority and in Holon, Israel. Based on interviews with members of the Samaritan community and archival research, Digital Samaritans explores what some Samaritans want from their diaspora of manuscripts, and how their rhetorical goals and objectives relate to the contemporary existential and rhetorical situation of the Samaritans as a living, breathing people.How does the circulation of Samaritan manuscripts, especially in digital environments, relate to their rhetorical circumstances and future goals and objectives to communicate their unique cultural history and religious identity to their neighbors and the world? 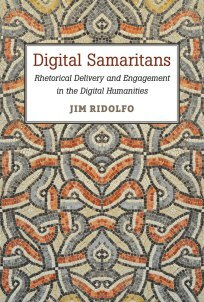 Digital Samaritans takes up these questions and more as it presents a case for collaboration and engaged scholarship situated at the intersection of rhetorical studies and the digital humanities.